Free Tennis Tips That Will Help You Improve Your Game! In this section of the website I will provide you with free video tennis tips! 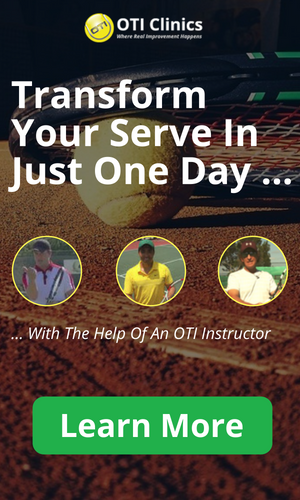 Visual tennis instruction is the best possible way for you guys to learn and improve. I also put together a mini-series of my Top5 Video Tips that will help you improve several aspects of your game! All you need to do to get them is sign up for my newsletter below. All sorts of tips are being handed out every day by coaches on the court, on the internet and even amongst tennis friends. What I need you to realize about these tips though, is that there is no quick way to becoming a great tennis player! Just picking up a quick tennis tip and using it will not transform your game. Only very focused work can do that! These tips should help you improve a small area of your game. If you really want to maximize your potential and learn how to play great Tennis, I recommend you check out my upcoming tennis video courses in the other sections of this website! You will find tips for all levels of the game. Whether you are a beginner or an advanced player, the tips here will apply to anyone. 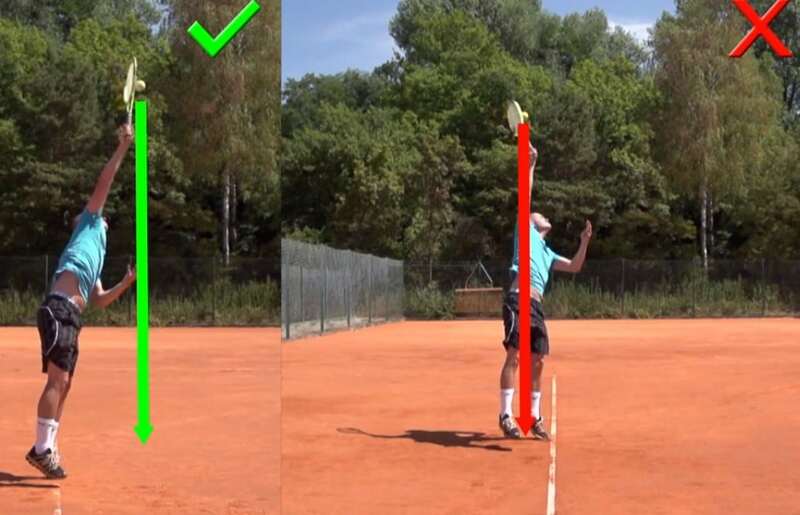 Lift The Ball On Your Groundstrokes! Today I want to share with you my number 1 tip for your topspin groundstrokes. In order to hit great groundstrokes you have to realize that you need to LIFT the ball up over the net! To me this is by far the most important thing to realize for almost every player I work with! What do I mean by lifting the ball ? By Lifting the ball I mean a movement with the entire arm from low to high. It doesn’t matter if you are hitting a forehand, one-handed backhand, or a two-handed backhand; the physics involved are the same! Almost all recreational players that I see swing too horizontal on a rather straight line and not enough from low to high. This results in lots of balls landing in the net and it is the number 1 mistake I see made on the tennis court! The reason most players swing too horizontal is that they see their target through the net. Looking through the net you are actually looking at your target on a downward sloping line, which is why people tend to swing that way. I am certain that people would miss a lot less in the net if you couldn’t look through the net. Sometimes on television you can see these great animations where they show the flight-path of the ball. Those lines always have a really nice arc looking something like this. In order to get that kind of a flight path you need to lift the ball! Allright so next time you go out on the court try lifting the ball more and feel free to exaggerate in the beginning! You are most likely not gonna lift as much as you need to even if you try very hard. Balance is a key aspect for any good grounstroke. Ideally you want your upper body to remain rather straight, your head very still, and then you rotate around this axis which does not move. What happens all too often is that players are moving all over the place while hitting their groundstrokes. One common mistake is to move the body back to the middle while hitting, before the shot is actually finished! In order to avoid this you should practice hitting and finishing on balance. What I mean by this is that you hit your shot, forehand or backhand, and afterwards you stand still on balance for about a second. This usually helps a lot in cleaning up your strokes! Stay Away From The Sidelines! Almost all tennis matches are won by the player that hits less unforced errors. There are three possible mistakes you can make on the tennis court: Hitting deep, hitting wide, and hitting into the net. The worst mistake is a shot in the net, which has a lot to do with the importance of depth. The second worst mistake is a shot that goes wide. The mistakes that you need to worry about the least are shots that land deep/long behind the baseline. The best players realize this and they barely miss in the net or wide! It takes a lot to miss balls long behind the baseline and if you focus on clearing the net and staying away from the sidelines then you will most likely improve your game a lot! Get The Ball In Play! The number 1 goal for your return of serve is to get the ball in play. This is something many players unfortunately misunderstand! The return of serve is a difficult shot unless your opponent has a really bad serve. The ball is coming at you at a very different angle than you are used to from hitting groundstrokes and you don’t get to hit many returns in a row to get into any kind of groove. What I ususally see is players taking big swings at the return and trying to hit incredible winners. They might make 1 out of 5 and are surprised as to why they can never break their opponents serve! Therefore it is extremely important to set yourself a goal to get the ball in play at all cost. This is the number 1 goal to think about when you are the returner. Try to keep count of how many returns you actually put in play to make your opponent earn those points! More great tennis tips coming soon!